The Explosive Disposal Unit (EDU), often referred to as the "Bomb Squad" is a team of highly trained officers, specializing in the investigation and handling of explosives and improvised explosive devices (IED's). The team is comprised of 7 explosive technicians and one apprentice/assistant. Explosive Technicians receive extensive training in the detection, dismantling, and disruption of improvised explosive devices designed for a criminal purpose. Explosives technicians also receive training focused on the handling of chemical, biological, radiological and nuclear (CBRN) threats. 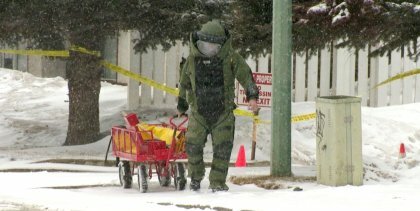 The Saskatoon Police Service EDU has numerous weapons, tools and tactics used in the disruption and dismantling of explosive devices. Technicians are certified in the use of robots and radiography (x-ray) equipment, and receive training in the recognition of electronic components often associated with criminal IED's. 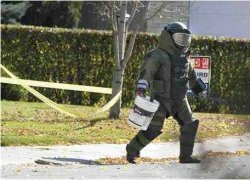 Technicians receive their basic police explosive training at the Canadian Police College in Ottawa, and must meet federally established standards in order to obtain their technicians' license. Each technician must be re-certified every three years in order to stay current in their field. All members of the Saskatoon Police Service EDU have full time policing duties, with their membership on the EDU as a part time assignment. The team comes together monthly to train in various aspects of explosive handling and investigation. Team members are also on "standby" 24/7 in the event there is a need for their expertise. They attend various training courses, seminars and conferences throughout the year, in an effort to hone their skills and insure a high state of readiness.